The use of British designed body armour by the Canadian Army in World War Two is not well known and few examples have survived in museums and private collections. 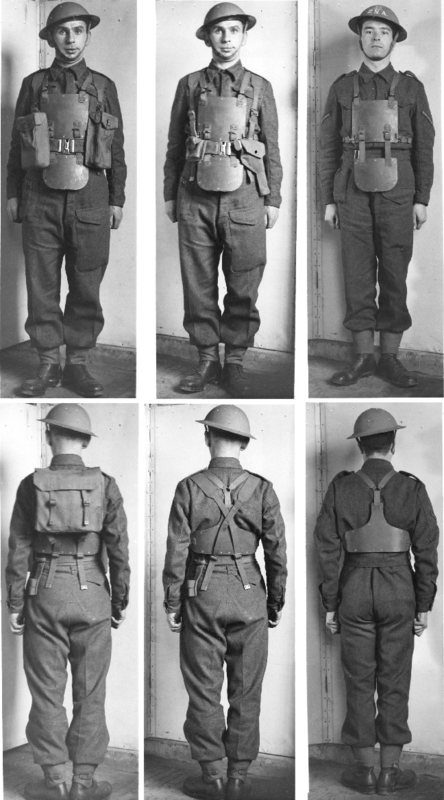 Brian L. Davis gives an excellent overview of the British Medical research Council (MRC) Body Armour in his book “British Army Uniforms & Insignia of World War Two”. 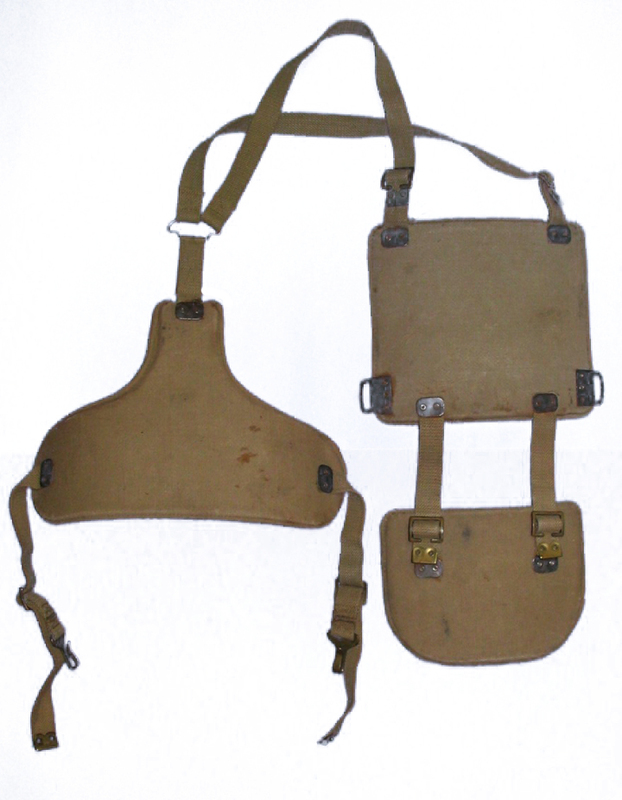 Tracing the use of MRC Body Armour can be very difficult as photographs of MRC Body Armour in use during World War II are scarce since the prescribed method of wear was underneath the Battledress (BD) uniform. From 1940 until 1942 the British Army and the Medical Research Council (MRC) worked hard at developing a set of body armour that could fill the needs of all three services had to be considered as well as designing a piece of equipment that could be worn comfortably. The material used in this body armour was the same 1mm manganese steel found in British helmets. 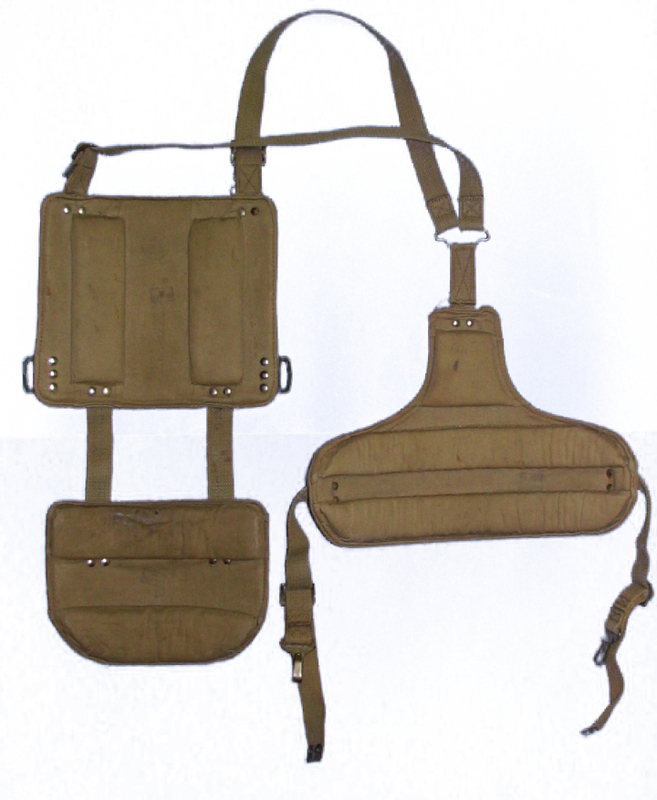 The body armour, weighing 3½ pounds, was designed so that its three pieces covered the vital parts of the body. 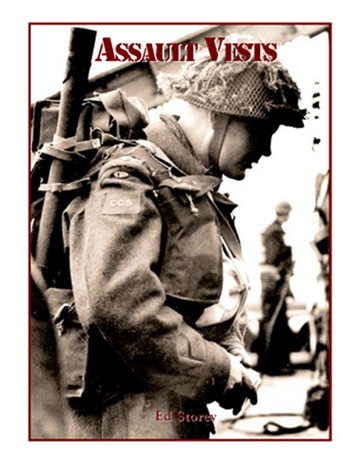 Simon Dunstan also gives a rather detailed description of the testing that the MRC Body Armour was subjected to in his book “Flak Jackets 20th Century Military Body Armour“. 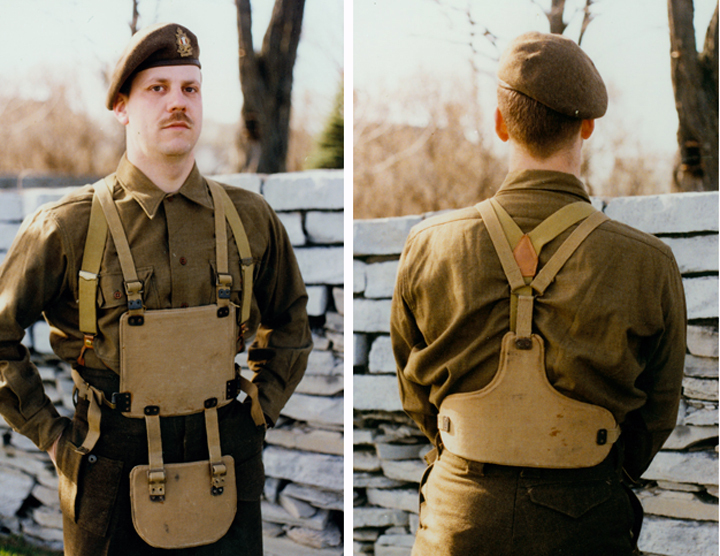 Canadian Army use of the MRC Body Armour is not well documented and little known. By studying World War II photographs and by talking to veterans, a pattern starts to emerge. A 3rd Canadian Infantry Division veteran, Sapper Jack Fleger from 6 Field Company, Royal Canadian Engineers, fought in North-west Europe from the Normandy Invasion in June 1944; until the fighting around the Breskins Pocket, Belgium, in October 1944 when he was wounded in the face. For the Invasion of Normandy, Mr. Fleger waded ashore with the following equipment: 1937 Pattern Web Fighting Order, Mine Detector, Life Belt, Number 4 Mark I* .303 Lee-Enfield and MRC Body Armour. The Body Armour was to protect him from mine blasts, he dumped the Body Armour shortly after coming ashore. Lieutenant John J. H. Connors was a Stretcher Bearer Officer in the 4th Canadian Infantry Brigade (CIB) of the 2nd Canadian Infantry Division who fought in North-west Europe from the Capture of Caen in July of 1944, until the end of hostilities in May of 1945. The 4th CIB consisted of the following Infantry Regiments: The Royal Hamilton Light Infantry, The Royal Regiment of Canada and The Essex Scottish. Lieutenant Connors was one of two Stretcher Bearer Officers in the 11 Canadian Field Ambulance, Royal Canadian Army Medical Corps, and they usually worked in conjunction with the lead Infantry Battalions. 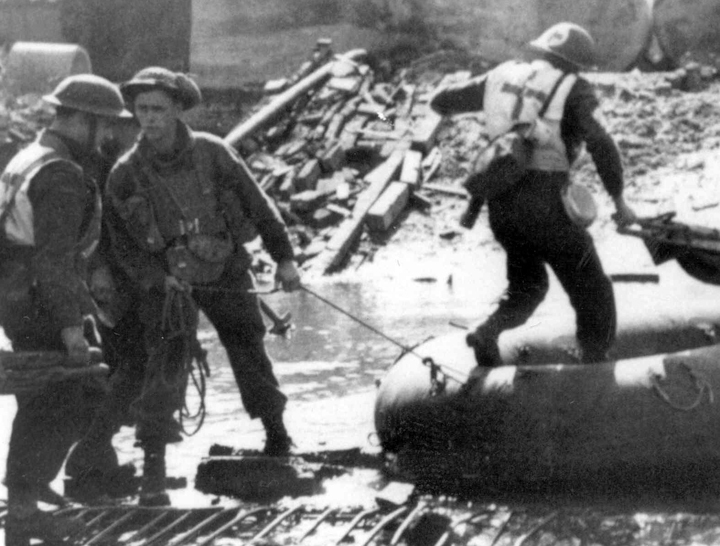 Infantrymen of Le Régiment de la Chaudière using a rubber raft to cross the Ijssel River, Zutphen, Netherlands, 7 April 1945. 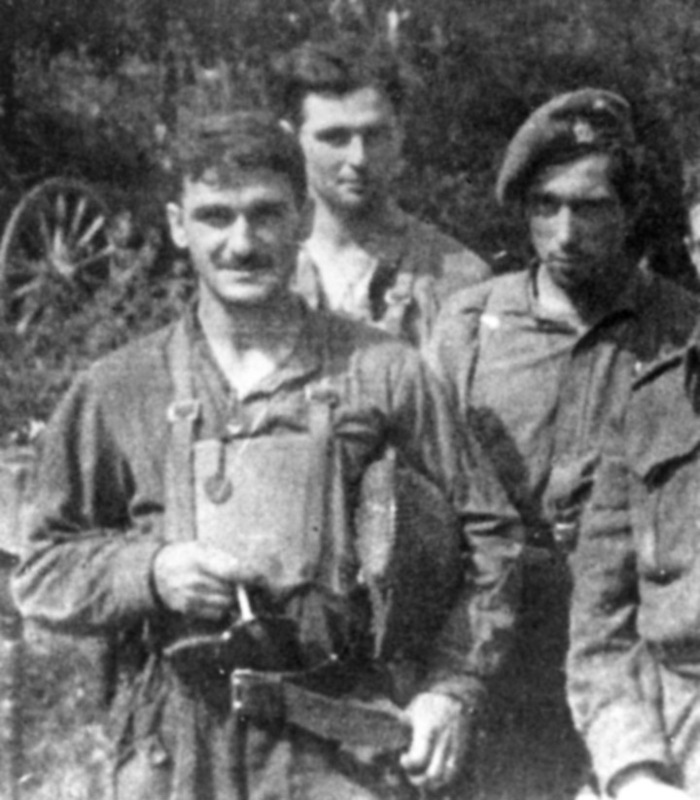 The nature of Mr. Connors work was very hazardous and in the Caen area he and his men managed to get some sets of MRC Body Armour from casualties who no longer needed them. He wore the armour throughout the North-west Europe Campaign and it is still in his possession. Mr. Connors even wore the Body Armour while sleeping in trenches to help cover the exposed portions of his body. He noted that some of those he saw wearing the MRC Body Armour were primarily more concerned with covering their reproductive organs than any other part of the body. Another veteran of the 2nd Canadian Infantry Division I have spoke to also stated that he wore the MRC Body Armour. I did not record his name, but in conversation he mentioned that he served with the Fusiliers Mont-Royal, 6th CIB in North-west Europe. He mentioned that MRC Body Armour was used on specific occasions; usually by the lead sections in the assault; and that the body armour gave those that wore it an added sense of security. Photographic and anecdotal evidence tends to point to the 2nd Canadian Infantry Division as the primary user of MRC Body Armour from the time they arrived in theatre in July, 1944 until the end of the war in May, 1945. Canada fielded five divisions in World War II, why the 2nd Canadian Infantry Division had what appears to be almost exclusive use of the British MRC Body Armour is open for more investigation. Copp, Terry, “The Brigade – The Fifth Canadian Infantry Brigade, 1939-1945”, Stoney Creek, 1992. Davis, Brian L., “British Army Uniforms & Insignia of World War Two”, London, 1983. Dunstan, Simon and Ron Volstad, “Flak Jackets 20th Century Military Body Armour”, London, 1984. Whitaker, W. Denis and Shelagh, “Tug of War – The Canadian Victory That Opened Antwerp”, Toronto, 1984. [i] Brian L. Davis, “British Army Uniforms & Insignia of World War Two” (London, Arms and Armour Press, 1983), p 246-247. [ii] Simon Dunstan and Ron Volstad, “Flak Jackets 20th Century Military Body Armour”, (Osprey Men-at-Arms Series, 1984, Number 157), p 8-9. You can rate this article by clicking on the stars below. You are also encouraged to leave a comment.